The Gare Montparnasse (French pronunciation: ​[ɡaʁ mɔ̃paʁnas]) (Montparnasse Station), officially Paris-Montparnasse, is one of the six large Paris railway termini, and is located in the 14th and 15th arrondissements of Paris. The station opened in 1840, was rebuilt in 1852 and was relocated in 1969 to a new station just south of the original location — where subsequently the prominent Montparnasse Tower was constructed. 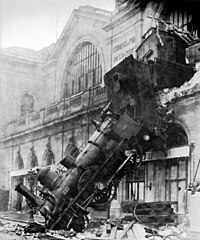 The original station is noted for the Montparnasse derailment, where a steam train crashed through the station in 1895, an event captured in widely known photographs — and reproduced in full scale in several locations. The station serves intercity TGV trains to the west and south-west of France including Tours, Bordeaux, Rennes and Nantes, and suburban and regional services on the Transilien Paris – Montparnasse routes. There is also a metro station. During the 1960s, a newer station integrated into a complex of office buildings was built. In 1969, the old station was torn down and the Tour Montparnasse built on its site. An extension was built in 1990 to host the TGV Atlantique. Granville–Paris Express wreck on 22 October 1895. The Gare Montparnasse became famous for the derailment on 22 October 1895, of the Granville–Paris Express, which overran the buffer stop. The engine careered across almost 30 metres (100 ft) of the station concourse, crashed through a 60-centimetre (2 ft) thick wall, shot across a terrace and smashed out of the station, plummeting onto the Place de Rennes 10 metres (33 ft) below, where it stood on its nose. Two of the 131 passengers sustained injuries, along with the fireman and two conductors. The only fatality was a woman on the street below, Marie-Augustine Aguilard, who was temporarily taking over her husband's work duty while he went out to get the newspapers. She was killed by falling masonry. The railway company later paid for her funeral and provided a pension to look after her two children. The accident was caused by a faulty Westinghouse brake and the engine driver, who was trying to make up lost time. A conductor was given a 25-franc fine and the engine driver a 50-franc fine. Replicas of the train crash are recreated outside the Mundo a Vapor ("Steam World") museum chain buildings in Brazil, in the southernmost state, Rio Grande do Sul, in the city of Canela. Wikimedia Commons has media related to Gare de Paris-Montparnasse. Gare Montparnasse – current photographs and of the years 1900. Mundo a Vapor Museum The Brazilian museum which contains the 1895 derailment accident replica.